Maximal oxygen consumption or VO2max, refers to your body’s maximal ability to utilize oxygen and is considered to be the best indicator of aerobic fitness. Since good aerobic capacity depends on a healthy cardiovascular system, VO2max is important when evaluating cardiovascular health and risk. Additionally, a baseline test creates a reference point for evaluating the impact of an aerobic training program. 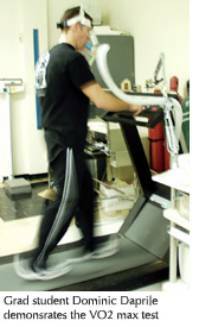 VO2max is determined by a graded exercise test on a treadmill or stationary bicycle. The test consists of a person exercising while the workload is gradually increased until the person can no longer continue (~12-15 minutes). During the test, the person breathes through a mouthpiece and their expired air is analyzed for oxygen content by a computer to evaluate VO2max.